Jewellery Trends, Diamond,Ruby, Sapphire,Emerald,Antique Jewelry,Jewelry,Fashion and Style: Amosu Ultimo Diamond - World’s most expensive iPhone! 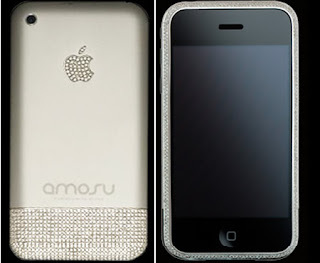 Amosu Ultimo Diamond - World’s most expensive iPhone! The world’s most expensive diamond encrusted iPhone "Amosu Ultimo Diamond iphone" is priced at £89,000 ($177,300). In its most dazzling form, this diamond edition seems to have it all. Perfectly set with 1179 dazzling 16.18 carat diamonds, the phone is handcrafted by skilled craftsmen using only the most exceptional materials.Taking a closer look, this exclusive Ultimo Diamond Iphone features 458 diamonds caked around the flat-front face. While the rear bottom case is made of 18 carat solid white gold encrusted with 660 diamonds. And the cherry on the cake is the apple logo which has 61 diamonds. This ostentious dazzling god-phone comes in a luxury wooden box.